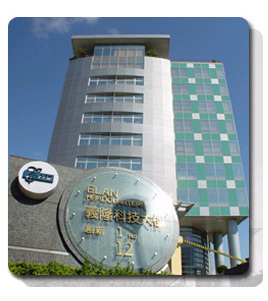 According to Reuter’s report, Taiwan-based company Elan Microelectronics has announced a settlement of a patent dispute with Apple related to multi-touch technology. Elan states that Apple has agreed to cross-license some patents and pay $5 million to avoid future disputes regarding said intellectual property. Kevin Rivette, managing partner at intellectual property firm 3LP Advisors LLC, said in an interview with Bloomberg that if Apple were to abandon its lawsuits against Android smartphone manufacturers and instead negotiate licensing fees for its patented technology, Apple could collect $10 for each Android device sold. But as far as we know Apple is not interested in licensing Apple's patented technology to Android manufacturers. Steve Jobs called the Android products as the “stolen” ones and wanted “to go thermonuclear war” against Android. "A scorched-earth strategy is bad news because it doesn't optimize the value of their patents -- because people will get around them," Rivette told Bloomberg. "It's like a dam. Using their patents to keep rivals out is like putting rocks in a stream. The stream is going to find a way around. Wouldn't it be better to direct where the water goes?" Such approach makes mobile devices manufacturers to modify their infringing products and work around Apple's intellectual property. For example, earlier this month, the U.S. International Trade Commission found that HTC was in violation of an Apple patent related to "Data Detectors," but only a day later HTC said it was testing new devices that work around Apple's patent. Apple is expected to build its own chips like in the iPhone and iPad for its anticipated television set, instead of utilizing third parties chips from a company such as Intel. Taiwan Semiconductor Manufacturing Company (TSMC), Advanced Semiconductor Engineering and Siliconware Precision Industries are three companies expected by DigiTimes to bid on orders with Apple. 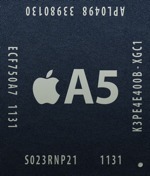 The companies could build custom ARM-based chips to power an Apple television, much like the A4 CPU, first released in the iPad in 2010, is found in the current Apple TV set-top box. Earlier this year we reported that Apple signed the agreement on the production of next-generation "A6" and "A7" processors for the iPhone and iPad with TSMC and would utilize its 28nm and 20nm process technologies. It is possible that Apple television set will use the same iPhone and iPad’s chips. The Apple TV is also expected to be assembled by Foxconn Electronics, which is the manufacture of most of Apple’s devices. Apple will have finalized the hardware standards for its television set by the end of the second quarter of 2012, only after that, the company will begin placing orders for its customized chips. Apple already used such approach to build its iPad and iPhone lineups. 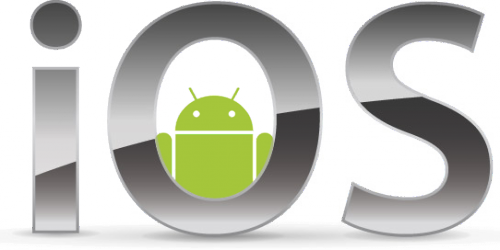 According to Bloomberg, Apple’s ongoing patent war with the manufacturers of Android-based devices has mixed results. Bloomberg wrote that Apple could cut its losses and earn 10$ per Android-based device sold if the company would reach settlements with its competitors. Early this month the rumors suggested that Intel’s next-generation Ivy Bridge processors would launch in May. Theses mobile processors are expected to be used in Mac mini, MacBook Pro and MacBook Air lines. 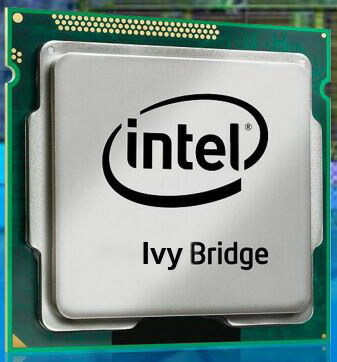 Now DigiTimes reports that new Ivy Bridge processors may debut in early April, with both desktop and mobile processors launching around the same time. According to DigiTimes, Intel has informed its partners that the company is going to "fully release" Thunderbolt tecnhology in April of 2012. Reportedly, Intel plans to release Thunderbolt-supported notebooks, desktop PCs and motherboards at that time. According to Hebrew-language newspaper Calcalist, Apple finalized its acquisition of flash memory maker Anobit, which is said to have been recently informed their employees about the finalized deal. The final price remains unknown, but could be in between $400 million and $500 million. The reported goal of Apple's acquisition of Anobit is to increase the amount of memory in its portable devices, like the iPhone, iPad and MacBook Air, as well as to improve the reliability of solid-state memory. Apple is now expected to build a development center in Haifa, where Intel, Google, Microsoft, Yahoo and Qualcomm also have facilities. The Anobit purchase is believed to be the first acquisition for Apple with Tim Cook as CEO. 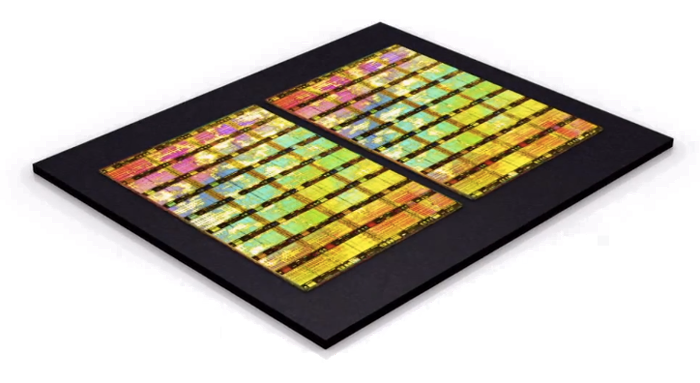 Anobit is a 200-employee Israeli fabless semiconductor company that specializes in flash storage. Anobit has about 100 pending and granted patents, and was first founded in 2006. Apple is said to be particularly interested in the company's proprietary memory signal processing technology and planning to build a semiconductor development center in Israel. 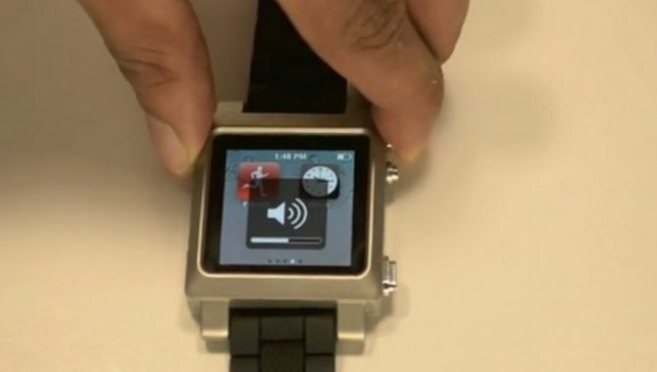 Nick Bilton from The New York Times, who in October wrote that large parts of rumoured Apple’s television sets appeared in the company's supple chain, now reports that Apple may be researching and even prototyping new wearable devices. The resent rumors suggesting that Apple may purchase Israeli firm Anobit, nudge that Apple plans to set up its first research and development center outside of its Cupertino headquarters. Sources inform "Globes" that Apple Inc. has decided to open a development center in Israel focusing on semiconductors. The decision was taken even before the company entered into talks to acquire Herzliya-based flash storage solutions provider Anobit Ltd..
Apple has hired Aharon Aharon, a veteran player in Israel's high tech industry, to lead the new development center. Analyst Mark Moskowitz with J.P. Morgan expects that MacBook Air sales will reach an average of 1.6 million units per quarter over the next 12 months. 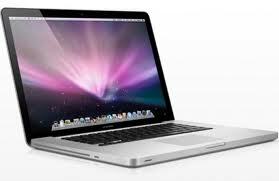 In the third quarter of calendar 2011, Apple sold 923,000 units of the MacBook Air, representing 838.6 percent year-over-year growth. Comparing with the previous quarter MacBook Air sales grew by 43.8 percent, outpacing total Mac unit growth of 17.1 percent. China is now becoming a strong driver for growth of MacBook Air sales. Last quarter, MacBook Air units grew 339 percent year over year in China, versus 76.5 percent for the rest of the Mac lineup. Moreover, notebooks based on Intel's Ultrabook specification are highly unlikely to be a significant threat to the MacBook Air. "In general, we think that Ultrabooks are highly-discretionary devices, and pricing on competitive offerings must fall below $800 before posing a viable threat to Apple's MacBook Air," he wrote in a note to investors. "In our view, Apple's first mover advantage and optimized feature set and form factor command a higher price that early adopters, productivity users, and Apple enthusiasts are willing to absorb." The new report claims that Apple has transferred several patents to the patent-licensing firm Digitude Innovations and accuses the company of aiding a so-called "patent troll." Digitude Innovations filed suit against tech giants this week, including Research in Motion, HTC, LG, Motorola, Samsung, Sony, Amazon and Nokia. Having investigating the lawsuit, TechCrunch found out that two of the patents mentioned in the lawsuit had belonged to Apple earlier this year. Apple is claimed to transfer a dozen of patents to the company called Cliff Island LLC earlier this year. Noteworthy, the company's address is the same as Digitude investor Altitude Capital. Cliff Island apparently transferred the patents to Digitude. In June Forbes reported that Digitude Innovations was established by Altitude founder Robert Kramer. Digitude is in the business of acquiring patents to sue others, the company has been labeled a "patent troll." The company is utilizing a new investment strategy of allowing investors to contribute patents instead of money. Participating companies would then receive a license for all of the firm's patents. It is not clear whether Apple entered into an agreement with Digitude, but Apple may use the company as a "hired gun" in its patent battles. "The idea that the company didn’t have any options other than handing over valuable patents to a patent troll — knowing full well that it would then use those patents to sue other tech companies — seems ludicrous." Intel intends to launch its mobile Ivy Bridge processors in April and May of next year. The report posted yesterday ttracts special attention to the fact that the Ivy Bridge platform, both mobile and desktop, will provide support up to three independent displays. Noteworthy, one of those displays will be an internal one. While we're talking about graphics, as with the desktop Ivy Bridge processors, the mobile processors also support up to three independent displays, although one of these will be the built in display in the notebook, but hopefully we'll see notebooks with a DisplayPort connector as standard come next year. The current Sandy Bridge platform supports only two independent displays. For example, the 13-inch MacBook Pro can only drive two external displays by turning off its internal display. More powerful MacBook Pro models can currently drive two external displays in addition to the internal one. But Ivy Bridge opens door to a direct support of three displays. 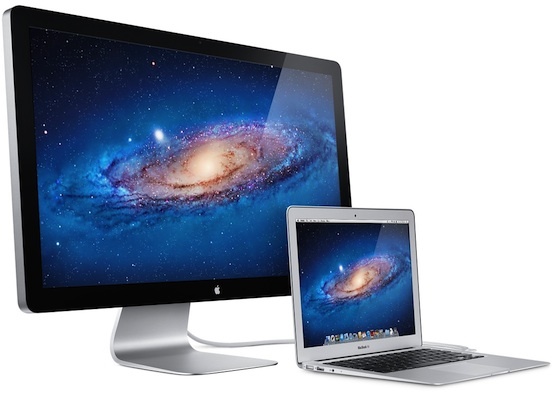 Users of the MacBook Air will be able to connect to two external displays. Apple has reportedly filed a request for a preliminary injunction to prevent sales of the revised Galaxy Tab 10.1N, a design-tweaked variant of the original Galaxy Tab 10.1, in Germany. 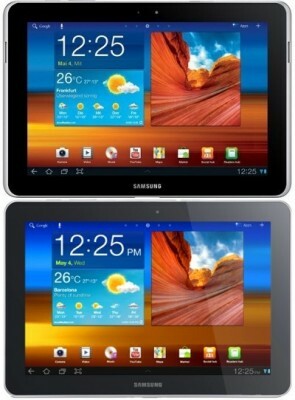 Samsung launched Galaxy Tab 10.1N last month in attempt to deal with the ban on Galaxy tab 10.1 sales in the country. Apple has requested a preliminary injunction, and the Duesseldorf regional court has scheduled a hearing on the matter on Dec. 22, a spokesman for the court told Dow Jones Newswires on Tuesday. The move has no effect on sales and distribution of the product, Samsung said in an emailed statement, while Apple repeated earlier comments that it intends to protect its intellectual property. 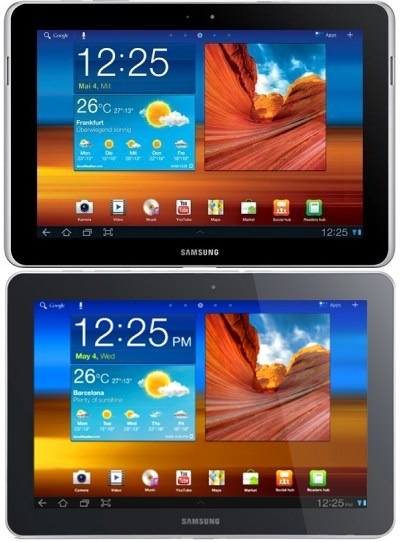 Apple clearly believes that slight changes in design of the Galaxy Tab 10.1 are not sufficient to overcome the ruling that the Galaxy Tab design is almost similar to the design of the Apple’s iPad, and that is why Apple has decided to claim a new injunction. 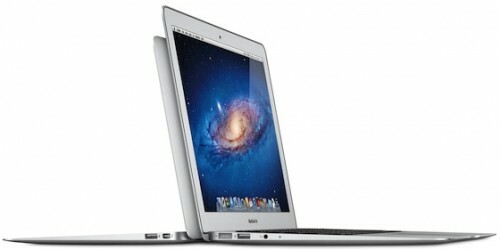 Digitimes reports that Apple plans to update its MacBook Air line in the first quarter of 2012. The company is expected to launch a new 15-inch model alongside refreshed 11.6-inch and 13.3-inch models with Intel's Ivy Bridge processors that will bring significant graphics improvements and new OpenCL support. The sources noted that related upstream players have already started pilot production of the MacBook Air models and will add a 15-inch model into the product line to expand its reach in the ultra-thin notebook market. Apple is likely to provide discounts on the current MacBook Air models ahead of the debut of the new models. First rumors about new ultra-thin 15-inch notebook from Apple appeared in July. Digitimes also reported that component production for the notebook had begun with an eye toward a second quarter 2012 launch.